do you have any available wallspace left? are you questioning yourself which unique decoration could be hang up there? then your are dead right with this blog article. we invite antler furnishing followers to have a look on our new arrived sets of antique and vintage black forest deer trophies. 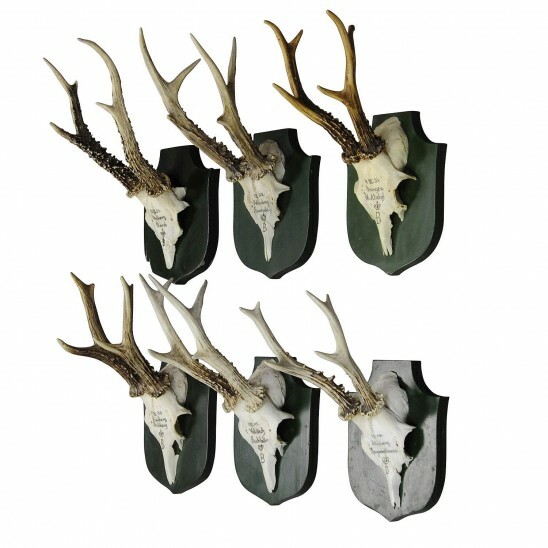 if your expextations for antler decoration are rather high then you now have the full choice of various different sets of antique and vintage deer trophies. some of them are originals remaining from the stately home of palace salem in the south of germany. other were shoot by membres of the family of margrace maximilian of baden. handwritten inscriptions of the sculls with family emblem and initials as well as date and place of hunt. don´t miss it.